Anyhow, we’ve got some cash to spend on players. Best part of £40m. Looking at the squad, we could do with upgrades at centre back, left back, central midfield, right wing and up front. But £40 million quid doesn’t go as far as it used to. In fact, finding upgrades at all within our price range, and current scouting vision, is nigh on impossible. So we’re gonna have to settle for added depth and prioritizing 2 or 3 positions. For now, we’ll have to make do with what we’ve got at left back and on the right wing. Kieran Gibbs, Theo Walcott and Alex Oxlade- Chamberlain are all “home-grown” options and worth a punt, but Nacho Monreal could be the first player I look to replace, next time there’s money to spend. So welcome to Michael Keane. He costs £12.5m, though there are some clauses in there, so it could be more if he’s particularly good. This signing comes with the bonus that he chose us over Tottenham. My coaching team don’t forecast any growth for Keane, but I’m hopeful that at 23 years old, and with my upgraded coaching staff, we can buff a few of those attributes. Same goes for our new striker Andrea Belotti, who at 22 must have a little more to come. 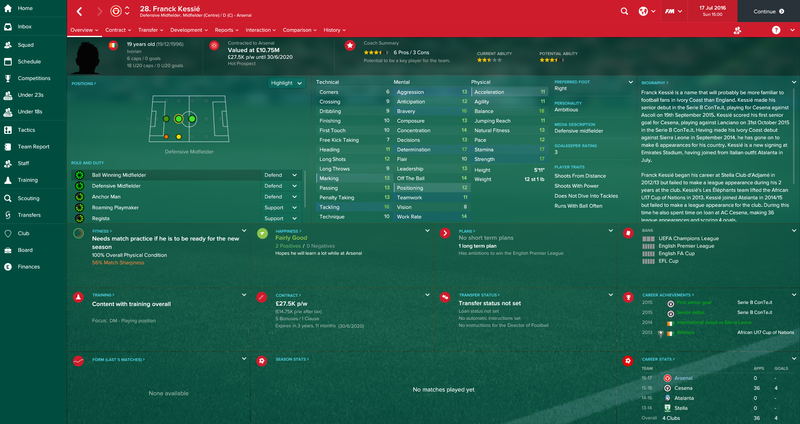 I’m guilty in this case of signing a player that I like “in real life” (whatever that is…) which can always be dicey, but he offers a good option as an advanced forward, different to Giroud’s target man role. He’s also £12.5m, also with clauses. Franck Kessie comes in as a ball-winning midfielder, which years and years of history suggests Arsenal need. He’s only 19, so our coaching should improve him to be a better option than Coquelin eventually. 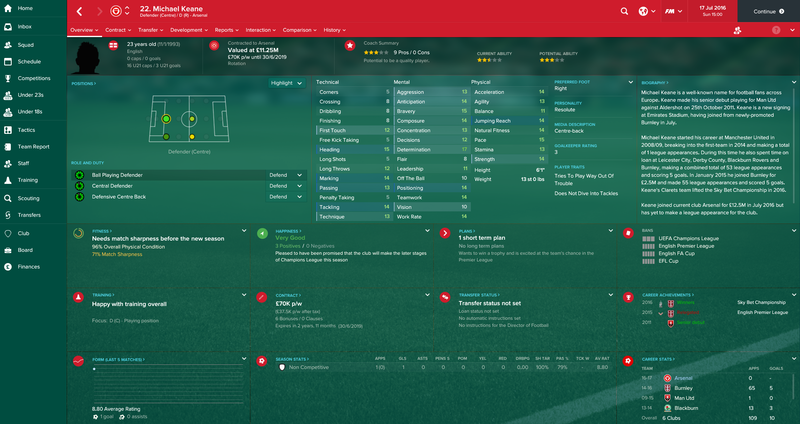 I suspect I may have slightly overpaid for him, but Atalanta were shrewd negotiators and I couldn’t get him for less than £15m (clauses again). With that, our business is complete, as the coffers are empty. The only outgoing transfer is Yaya Sanogo to Dijon for a meagre £550k, plus clauses. Ainsley Maitland-Niles and Chuba Akpom go out on loan to Brentford and Huddersfield respectively. This entry was posted in Gaming and tagged Arsenal, FM17, Football Manager 17. Bookmark the permalink. Signed Belotti and Kessie in my Milan save, both turned out to be excellent investments. Michael Keane I have used a little managing England, he seems to develop nicely, and earned a move to Man City in that save. 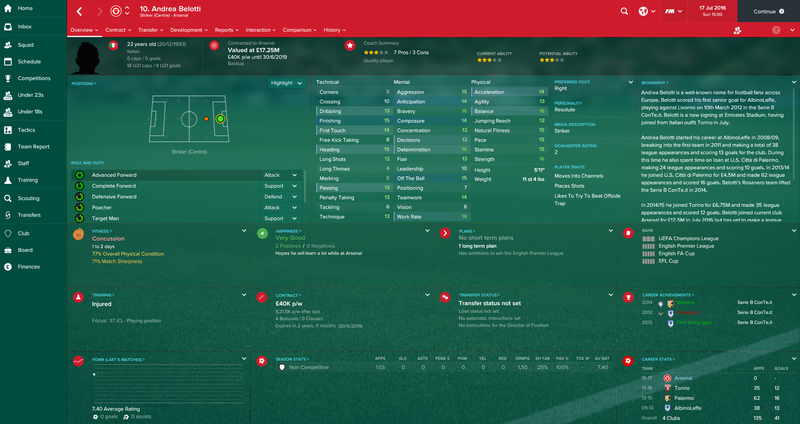 If you are looking for a LB who turns out great check out Llamas at Milan also. Anyway, good work soo far with the rebuild! Thanks, I’ve put Arsene Wenger on the first flight to Milan to have a look!